Significant boost for tourism promotion of Santorini and Milos islands at the Chinese market is expected from the trip of leading representatives of Chinese journalists and media organized by the Department of International PR Public Relations Department of the General Secretariat of Information and Communication with the contribution of MTC GROUP. 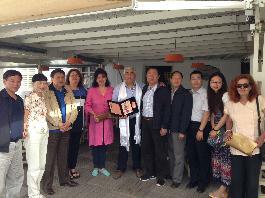 H 8 persons delegation, at the head of which is the Vice President of Chinese Journalists Association and Director of the Press Office of the Central Committee of the CP China k.Ming Lizhi, was on Santorini at Friday, May 17 and the next day, Saturday visited Milos. The mission, at which attended also Chairmen, Journalists, editors and executives Media, toured both Cycladic islands, visited archaeological sites, tried the local gastronomy and met with local authorities and representatives of tourism professionals.